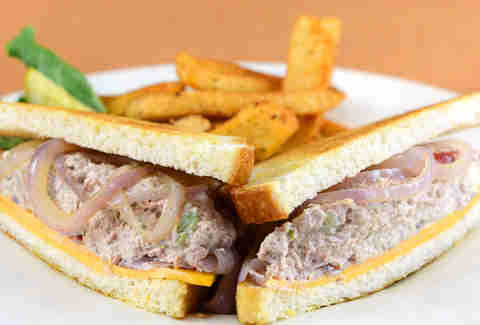 Tuna is a fish of contradictions: it's hard not to love, but it's also hard to love anyone who's just eaten it. To better understand the chicken of the sea (and the origins of that nickname), we quizzed Andrew F. Smith, author of American Tuna: The Rise and Fall of an Improbable Food, about everything from the popularization of canned tuna to the migration of the near-endangered bluefin. What type of tuna comes in cans? If you're buying light tuna, it's probably skipjack, which is not scientifically considered tuna, though nobody told that to the FDA before they commercially labeled it as such. In addition to the tuna family's adopted son, you'll also find canned albacore and yellowfin. They grow extremely quickly and reproduce in massive numbers at a young age, despite constant lecturing from their more mature bluefin cousins. Fishermen considered tuna a trash fish until the early 1900s, so, back then, the ocean was full of trash in a very different way than it is now. Americans looked down on it because of our preference for white over dark meat. Thus, the earliest canned tuna was the white meat of the albacore. Much of the flavor (and smell) of tuna comes from its oil, so in order to smother the stank, the earliest canners learned to remove the oil and pack it with water after steaming it. This worked to both remove bacteria and increase shelf life. Nowadays, the most expensive canned tuna is packed with extra-virgin olive oil to emulate the fish's natural oils. Before chicken of the sea was a brand name, it was a marketing trick that helped start the first wave of tuna consumption that hit just before WWI. Since it was then the cheapest protein on the market, Uncle Sam deemed tuna the perfect ration for Allied troops, who did not have to worry about offensive smells. The next boom for tuna came during the Great Depression, as mothers could cheaply and easily pack tuna sandwiches for their foul-mouthed children. What's the deal with the dolphin-free label? Science can't explain it, but yellowfins love to hang out underneath dolphins. Commercial fishermen send out spotter planes looking for dolphins, then drop nets underneath them and pull out massive schools of tuna. It's not without collateral dolphin damage. In 1990, the US passed an act to protect dolphins from net-fishing, but many think the act wasn't comprehensive enough, and that tuna catching practices are still pretty fishy. What's the deal with bluefin? Bluefin are the largest, oiliest, and most delicious of all tuna. They're also incredibly strong swimmers who migrate thousands of miles. So strong, in fact, that fishermen's nets were not solid enough to catch them until the adoption of nylon in the '50s. 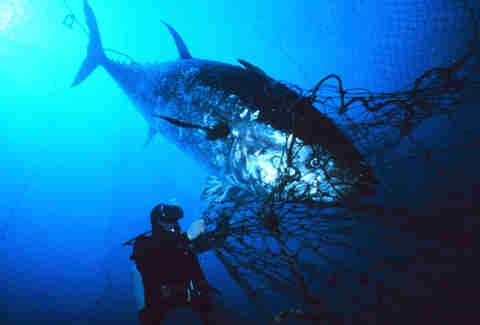 Back then, boats would pull up their nets for fear of bluefin destroying them. Now, a catch means the fisherman has netted thousands of dollars. The snarky answer is that they're not officially endangered because we don't actually know how many there are. But the consensus is that we are catching them at terrifyingly high, extinction-causing rates: Fishermen currently catch twice the legal limit and five times the limit scientists recommend. But what do they know?! What they know is that most bluefin are killed before they're old enough to reproduce. And if they do reach maturity, they can spawn more than 8mill eggs at once, but sushi eaters are lucky if two or three of those survive to grow into a deliciously expensive fish. But why would someone catch bluefin when they're not supposed to? Even though it is a totally overrated sushi fish, the incredible demand by the Japanese market has driven prices to ridiculous heights. If you catch a bluefin off the coast of Long Island (which can happen during one magical month of the year), it is immediately shipped to Japan and is for sale in the Tsukiji seafood market within 24hrs. A 500lb monster recently sold for a whopping $1.8mill, so it makes sense for a fisherman to risk a slap-on-the-wrist fine for violating a quota. What's the difference between fancy sushi varieties? Maguro is the broad Japanese term for tuna that blankets all species and cuts. 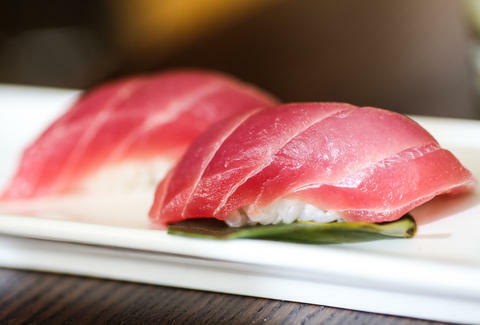 Bluefin is known as kuromaguro and is the fattiest and most delicious. Its Southern bluefin cousin (minamimaguro) has less fat and oil, and thus is far less costly. 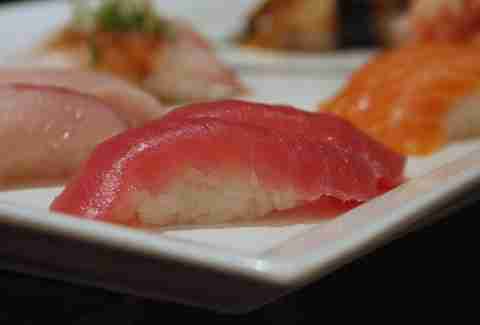 Yellowfin (kihada) is slightly pinker and has a milder flavor. Bigeye (mebachi) is leaner and a brighter red. Albacore (bincho) is the cheapest tuna-sushi cut -- it's also softer and flakier, so most agree the others are head and shoulders above it. You can generally order different cuts of each of these fish. For instance, the fattiest part of the belly (otoro) is the most highly-regarded cut, the akami are the leaner sides of the fish, and the chutoro is the chubby middle ground that's slightly less fatty than the main part of the belly, but will still taste great in yours. Dan Gentile is a staff writer on Thrillist's national food and drink team. He recently tried tuna canned in olive oil and can assure you it is worth the extra 200 pennies. Follow him to more cheap indulgences at @Dannosphere.